Shot in gorgeous black and white, The Happiest Day in the Life of Olli Mäki opens in Finland in 1962. Olli (Lahti) is an amateur boxer turned professional whose manager, Elis Ask (Milonoff), is on the verge of clinching a deal that will see Olli fight in a bout against the World Boxing Association featherweight champion, Davey Moore (Bosco Jr). If it goes ahead, it will be the biggest sporting event in Finnish history. But Olli has other things on his mind, particularly his friend Raija Jänkä (Airola). At a wedding they both attend, Olli discovers he’s attracted to her, but at first he doesn’t know what to do or say about his new feelings. When the bout is agreed, Olli finds himself too busy to spend much time with Raija, who is reduced to the role of onlooker by Elis’s insistence that Olli focus on the bout and nothing else. There’s also the issue of Olli’s weight, which needs to come down in order for him to be able to fight, but which he doesn’t seem to be concentrating on. With Elis arranging for a documentary film crew to record Olli’s preparations, it’s a further distraction for the boxer, and adds to the dissociation he feels with Raija. She too begins to feel the same thing, as Elis’ behaviour pushes her further and further away from Olli, almost to the point where she feels that she’s in the way. Meanwhile, Olli is forced to attend various dinners and promotional photo-shoots, adding to the disenchantment he’s feeling about the whole process. As the bout draws nearer, Raija returns to her home town, while Olli becomes increasingly withdrawn. Unable to train any further, Olli follows Raija and declares his feelings for her. Giving Elis no option, he stays with Raija and trains at his own pace, even fighting to get his weight down. At the weigh-in he just comes in under the required weight, and afterwards he proposes to Raija. Buoyed by this he approaches the bout with a renewed sense of optimism. And as he enters the ring, the stage is set for a career- and life-defining moment – but will it prove to be the happiest day of his life? 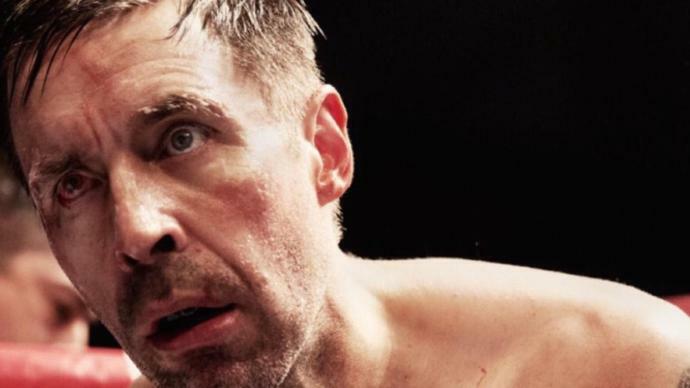 If you’re not Finnish, and more specifically, up to speed on Finland’s boxing history, then it’s unlikely that you’ll have heard of Olli Mäki. His career was a succession of ups and downs, beginning with his winning the European lightweight title as an amateur in 1959, his bout with Moore, and his European Boxing Union light welterweight title win in 1964. He continued boxing until 1973 when he retired to become a boxing coach and manager. At first glance, his life doesn’t seem to warrant a biopic being made out of one particular period in his life, even if it does include a championship title bout. But this is a boxing movie that isn’t about boxing, even though it inhabits that world. Instead, director Kuosmanen (making his full-length feature debut) and co-writer Mikko Myllylahti have turned their attention onto Mäki himself, his doubts and fears and longings outside the ring, and in doing so, have wrought an accomplished, intelligent, and compassionate portrait of a man fighting for more than just a title. From the beginning, Mäki seems bemused and oh-so-bored by all the media circus that surrounds him, a necessary evil he must endure on his way to the title bout. But he knows the ropes as it were, and goes along with Elis’ conditions and demands, trusting in the man who’s got him to this point. But the eagle-eyed viewer will soon spot that Elis is working as much to his own agenda as he is for Olli, and a scene late on where Elis is forced to take his children (and Mäki) with him on a rainy night to visit some of his backers, leaves the distinct feeling that there’s some form of corruption going on behind the scenes. But it’s enough to know that it’s there, because wisely, Kuosmanen doesn’t let this side trip upset the delicate balance he’s established by focusing on Mäki’s warring emotions. Mäki’s dilemma revolves around whether he should be a lover or a fighter, or whether he can be both. It’s clear that he wants to be both, but if he has to make a choice – and an irrevocable one at that – then it’s obvious that he’ll be a lover. But boxing still has a hold over him, one that’s stronger than his loyalty to Elis, and letting go isn’t as easy as he may have believed. It takes Raija’s complete absence from his training camp to push him in the right direction, and for a moment the movie teeters on the edge of discarding the title fight altogether in favour of a happy ending. But Raija, despite her reservations about the world of boxing, believes in Mäki, and it’s this that allows him to return to his training and make the weigh-in. What happens next may not be entirely unpredictable, and definitely not if you’re familiar with Mäki’s career, but it has a pleasing symmetry with what’s gone before. 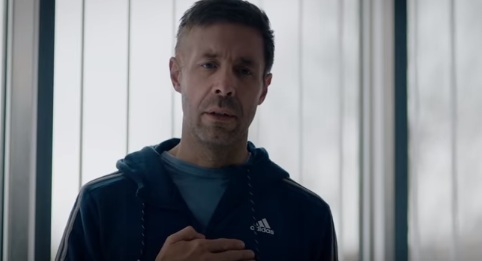 As the eponymous boxer, Lahti wears a worn-down expression for the most part, but it’s in keeping with Mäki’s bemused resignation, and the actor inhabits the role with a weary sincerity. 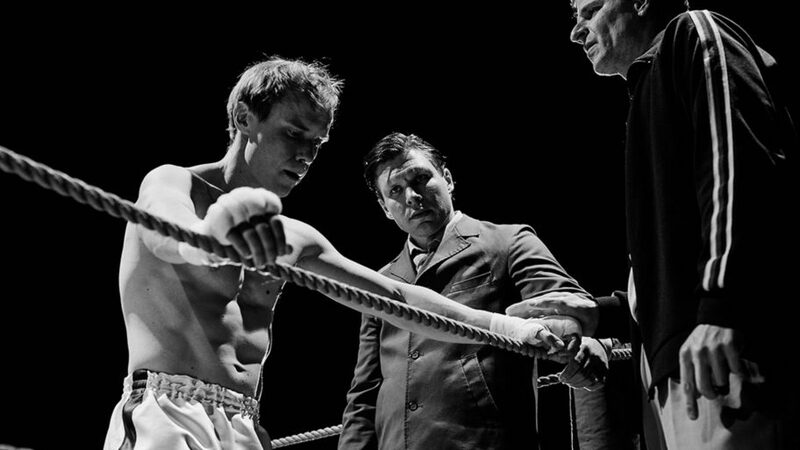 He also makes Mäki’s coiled physicality a part of his performance, as if the character is waiting for the right moment to explode but isn’t quite sure – outside of the ring at least – when that should be. As Raija, Airola (who in certain shots looks like Marion Cotillard’s younger sister) has an air of detachment and melancholy that again suits the movie’s mood and her character’s dwindling sense of importance when measured against Mäki’s training regime. 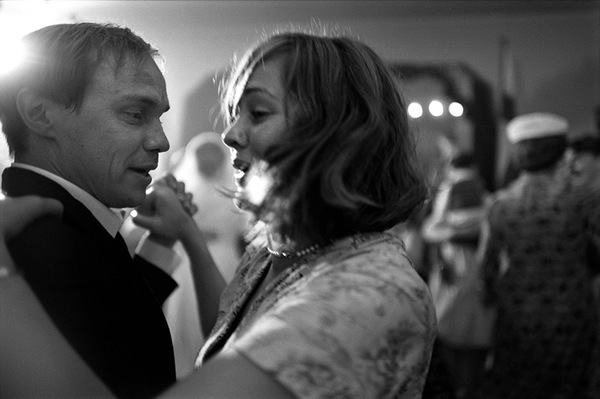 But she also gets a chance to explore Raija’s more winsome, frivolous side in a party scene that fully explains why Mäki falls in love with her. As the main rival for Mäki’s “affections”, Milonoff is equally as good as his co-stars, portraying Elis as a man desperately trying to hide how much this fight means to him both professionally and personally. It could have been a two-dimensional role in comparison to Lahti and Airola’s, but Milonoff takes the bare bones of what appears to be a stock character and fleshes him out with sympathy and understanding. Kuosmanen’s decision to make The Happiest Day in the Life of Olli Mäki in black and white proves to be a perfect choice for the material, and the depth and the richness of the images is further ensured by his use of a Kodak film stock that was never meant for feature length movies. The result is a movie that is frequently beautiful to watch, and which offers the viewer a variety of arresting images. Kuosmanen makes a number of other, equally important decisions, from the movie’s disciplined, elegant framing to the careful way in which he teases out each of the main characters’ feelings and desires in such a way that leaves them vulnerable and yet still secure. Add in themes around personal sacrifice and professional responsibility, as well as the pressures of an entire country’s expectations of an individual, and you have a movie that quietly and effortlessly draws in the viewer and rewards them in a variety of unexpected ways, not the least of which is a dry, diffident sense of humour. Rating: 9/10 – a movie that speaks to the heart and tells a wonderful love story in the process, The Happiest Day in the Life of Olli Mäki is a modest, yet enthralling movie that somehow failed to be nominated for an Oscar this year (though it did win the Prize Un Certain Regard at Cannes last year); putting all that aside, this should be on everyone’s list of must-see movies, and a welcome reminder that sometimes it’s the movies that receive the least fanfare that can often be the ones to have the most impact. True stories from the world of sport always aim for the inspirational, to show an individual or a team face up to and defeat the odds (which are often stacked against them). There’s room for self-doubt, absolutely there is, and there’s room for the odd setback or stumble along the way to – usually – championship glory, the miracle comeback, or both. 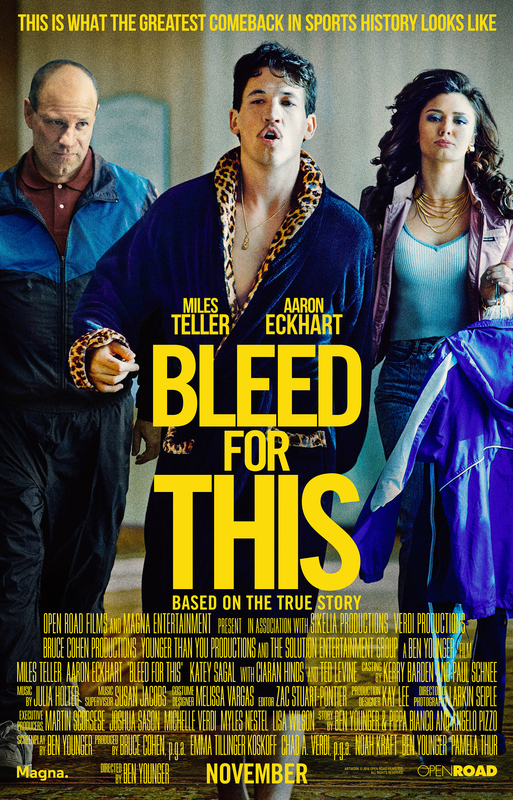 Bleed for This, the true story of boxer Vinny Pazienza (Teller), is a movie that includes a miracle comeback and championship glory. As such it should be a powerful, gripping feelgood story that grabs the audience’s attention and sympathies from the start, and then puts them through the same emotional wringer that the main character(s) went through. Well, the key phrase is “it should be”. 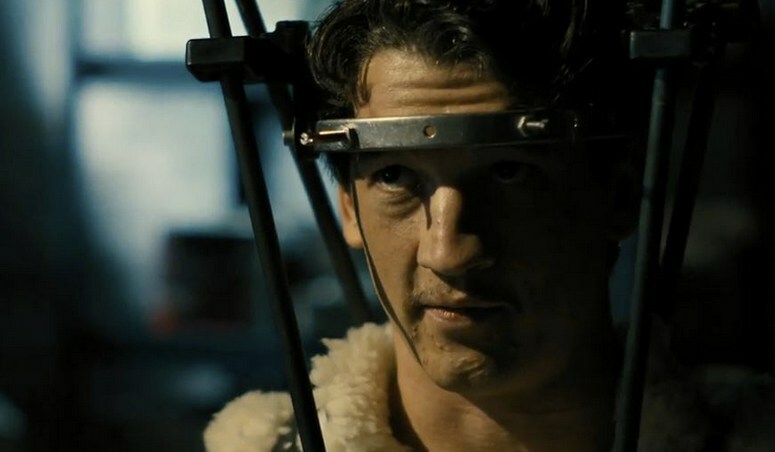 Bleed for This, however, looks and sounds as if it doesn’t know what an emotional wringer is, let alone be able to put an audience through it. The problem here is that, prior to the car accident that saw Vinny Pazienza suffer a broken neck (which could have meant his not walking ever again, let alone boxing), and way before he decided he was going to ignore doctor’s orders and work out while still wearing the halo that allowed his neck to heal normally, the boxer’s life wasn’t one that warranted a movie being made about it. He’d had a relatively successful career early on as a lightweight, but fighting at junior welterweight he found himself on a title losing streak. He moved up to junior middleweight, and began winning again, culminating in winning WBA World Jr. Middleweight Championship against Gilbert Dele. But then came that fateful car accident, and four steel screws in his head. Now, Pazienza’s life becomes interesting, now it becomes the kind of story that the movies would be interested in telling. And so, twenty-five years after that career-threatening injury, we have Bleed for This, the true(-ish) story of Vinny Pazienza’s recovery and return to the ring. 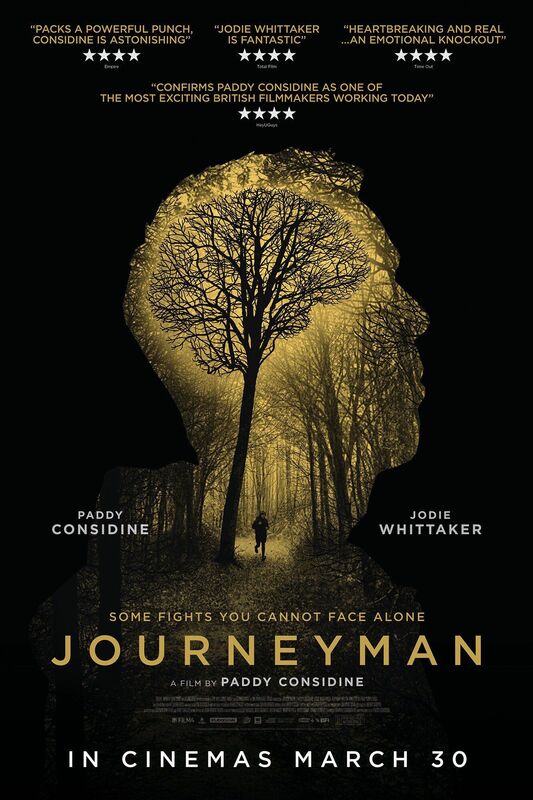 It has all the hallmarks of a traditional tale of triumph over adversity, of how one man overcame tremendous physical trauma to continue doing the one thing that gives his life meaning. But as you watch the movie, as you see Vinny Pazienza’s story unfold, there’s one thing you’ll be asking yourself: namely, where’s the passion? For, despite the drama and the incredible journey Pazienza took getting back into the ring, the movie version of that journey is about as exciting as watching the man train for two hours. Somewhere along the way, writer/director Ben Younger did something unforgivable: he forgot the passion. Sure there are times when Pazienza gets angry, but he’s also determined, sour, happy, uncertain, and resentful in equal measure. He experiences all the emotions you’d expect someone to experience in these circumstances, but the movie doesn’t allow any one of those emotions to have more screen time than the others, or to appear to have had any more effect on him. In essence, it’s all too neat. 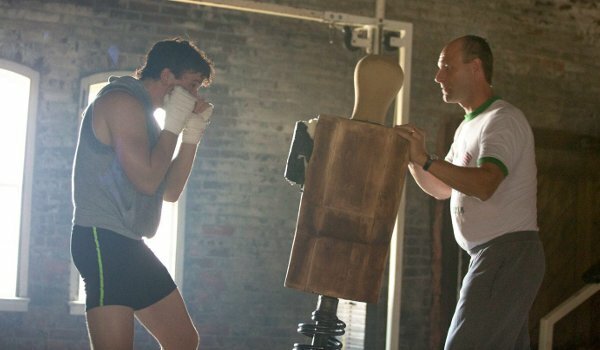 Bleed for This is a movie that signposts a tremendous struggle ahead, as Pazienza begins working out in the basement of his parents’ home. Aided by his trainer, Kevin Rooney (Eckhart), Pazienza lifts weights, regains definition (and the small degree of self-respect the script allowed him to lose after the accident), and shocks everybody with his progress. At least, he would shock everybody, but Younger approaches this section of the movie as if it were nothing more than a necessary bridge between the Dele fight and the eventual showdown with Roberto Duran (which wasn’t his first fight after the accident, that was with Luis Santana). There’s roughly a year between the accident and the comeback fight, but you wouldn’t know it thanks to Younger. It feels like a much shorter period because Younger’s impatient to get Pazienza back in the ring, to get to that miracle moment he believes the audience is waiting for. He also can’t resist throwing in a bit of family drama, with Pazienza’s father (Hinds) suddenly revealing a sense of guilt for pushing his son too hard earlier in his career. There are other times where the basic story gets padded out with superfluous moments that add little or nothing to the main narrative. It’s established from the very first shot of Rooney that he’s an alcoholic. But it keeps cropping up, and never goes anywhere; even when he’s arrested for attempted drunk driving, there’s no fallout or consequence to it. Where some movies would use this as an excuse to remove him from the corner for the big fight, thereby adding extra pressure on the fighter etc. etc., here it’s just padding, and flimsy, unnecessary padding at that. And then there’s the background machinations of fight promoters the Duva’s (Levine, Gelber), who are regularly accused of putting their interests ahead of Pazienza’s, as if the notion that they’re self-serving fight promoters has come completely out of left field (apologies for the mixed sports metaphor). But if that wasn’t enough, if the pedestrian plotting, and the stale characters, and the excessive padding, just weren’t enough to make the movie difficult enough to enjoy already, Younger executes the coup de grace by fumbling the fights themselves. A mess of choppy editing, awkward camera angles, tight close ups, and fragmented jabs and blows, the fights do all they can to hide the fact that Teller can’t box. Maybe he didn’t have enough prep time to look convincing, maybe he was hired for his acting ability and not his ability to throw a punch – either way, Teller isn’t going to be heralded for showing off his “skills” in the squared circle. As for the performances, Teller is hampered by the restraint Younger shows in his script, and several of the more dramatic moments in the movie show Teller in a good light, but it’s in the sense that he’s realised he’s only going to get so many opportunities to really shine. Eckhart is stuck with the worst receding hairline since Richard Attenborough in 10 Rillington Place (1971), while Sagal and Hinds do their best with characters who are two steps removed from being Italian-American parental stereotypes. There is a decent, emotionally gripping drama to be made from Vinny Pazienza’s comeback against the odds, but Bleed for This really isn’t it. It’s professionally made, and technically at least, doesn’t fault, but the way in which the story has been told is less than successful. Younger neutralises the drama that occurs outside the ring, and in doing so, fails to recognise that in this case, that’s where the drama ultimately lies. And by doing that he lets down his talented cast, the audience, and the man who went through all of it – and who now gets to see a movie about him that can’t focus on him properly, or present effectively the struggle he went through to be worthy of a movie about his life. 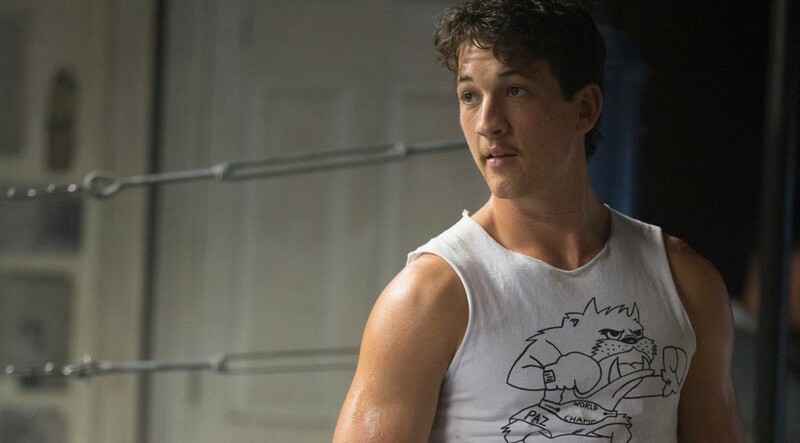 Rating: 5/10 – with Bleed for This lacking a cohesive screenplay and a real sense of its main character’s determination not to give up (which scares him because it’s too easy), this is one biopic that lets everyone down; it also lacks flair, and a sense of urgency, and only impresses thanks to Larkin Seiple’s gloomy, shadow-filled cinematography (a surprisingly good fit for the material), and a robust sound mix that at least makes the fight sequences feel more aggressive than we can actually make out. 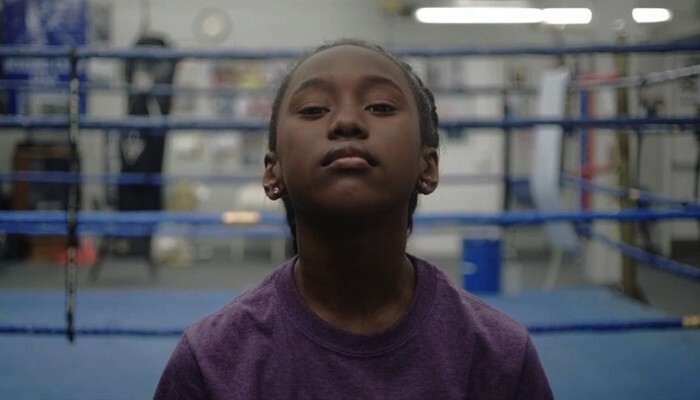 Toni (Hightower) is an eleven year old who hangs out with her older brother Jermaine (Minor) at their local gym where he’s training to be a boxer. She uses the time and opportunity to work out, and occasionally, spars with Jermaine and his friend, Donté (Grant Jr). It’s a situation she’s more than happy with, but when she becomes aware of the dance class that takes place elsewhere in the building, Toni becomes intrigued by the sense of camaraderie and commitment the girls in the group exhibit. Eventually she joins the group. Some of the older girls are rehearsing for an upcoming competition after achieving success in another. As Toni begins to make friends and learn the routines, one of the older girls has a fit. Though unexpected, the group carries on rehearsing until the same thing happens to another of the older girls. Suspicion for the fits falls on the water supply to the building, but even though everyone is advised to drink bottled water, the fits continue to affect several of the girls, including some of the younger ones. But is there a simple solution to what’s happening, or is it a form of hysteria that has no obvious source? Anna Rose Holmer’s debut feature is a low-key, minimalist drama that unfolds slowly and with great deliberation. It maintains a steady, thoughtful pace throughout, and uses an observational approach that’s almost documentary-like in style (and which should be unsurprising given Holmer’s background in documentaries, and where she’s known as Anna Farrell). The story is kept very simple, as Toni’s attempts to fit in are offset by the rising tide of paranoia that affects the dance group, even after the mains water is ruled out as a cause for the fits. Holmer is clever enough not to provide any definitive answers for the seizures, and the movie retains its credibility even as the mystery deepens. But while Holmer’s approach to her own material is consistently and carefully measured, it’s the material itself that doesn’t reward the viewer quite as effectively. Toni’s switch from boxing to dancing comes about thanks to her curiosity about the dance group, and a need to fit in amongst children of her own age and gender. But Toni makes few efforts to forge any friendships, and she remains a passive observer of each successive seizure and development. This makes it difficult to invest in the movie on a personal level, and while emotions run high on screen, the distancing effect adopted by Holmer makes Toni’s experiences more of an intellectual exercise than a moving one. 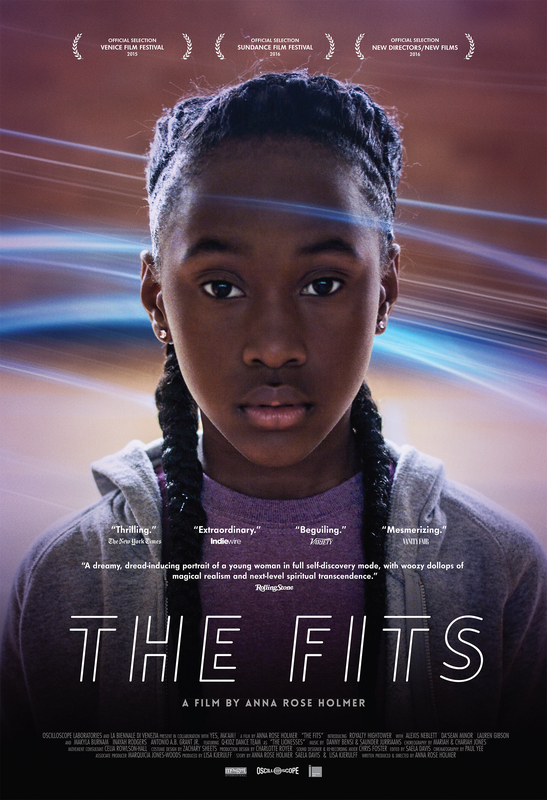 Rating: 7/10 – bolstered by a terrific performance by Hightower, The Fits is nevertheless a movie that keeps its distance from the viewer and makes it difficult to enjoy on a conventional level; strong on ideas, but with Holmer focused more on how the movie is assembled, it’s a feature to be admired for its rigorous approach rather than how affecting it is. The Rocky series has been a recurring staple of moviegoing since Sylvester Stallone first introduced us to the Italian Stallion back in 1976. The first movie had so much heart it sometimes felt like it would burst, and Stallone’s performance was a perfect match for the character. Rocky II (1979) was the inevitable sequel, and Stallone was canny enough to replicate enough of what made the first movie so good with newer elements that complemented the original. But then he made an unnecessary third movie, Rocky III (1982), and suddenly Rocky was fighting for an uneasy mix of revenge and morality. And then we had the blatant jingoism of Rocky IV (1985), with the Italian Stallion representing American pride at its most unseemly against a near unstoppable Russian opponent (thank God the Cold War was nearly over). That seemed to be it, but then Stallone came up with Rocky V (1990), an attempt at scaling back the stylistic excesses of the previous two movies, but which lacked an interesting story. By then, Stallone was forty-four and age was beginning to make its point (as the movie recognised), and the chances of Rocky Balboa still stepping into the ring and taking even more poundings was quickly dismissed. But just as you can never keep a good fighter down, a sixth movie appeared, Rocky Balboa (2006). It showed more of a respect for the series than parts III – V, and it gave Stallone a chance to show just how much affection he had for the character, and that Rocky could be rescued from unintended parody. And that, surely, everyone felt, was that. Well, almost. 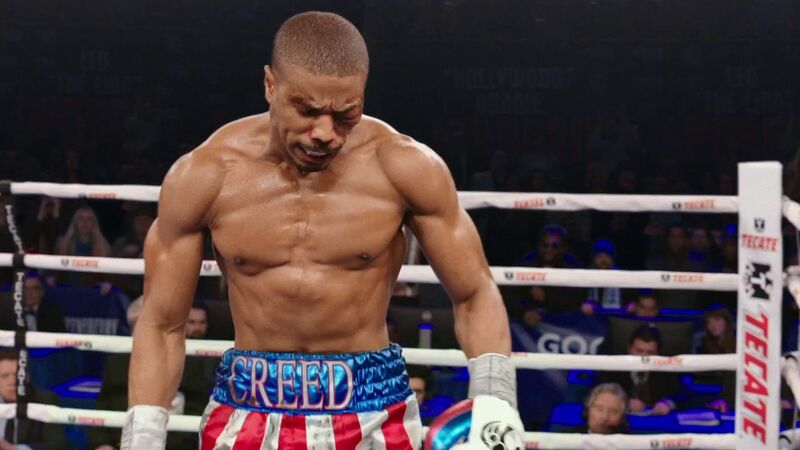 Now we have a seventh movie and a sixth sequel, except that this time around, the focus isn’t on Rocky Balboa but instead it’s on the illegitimate son of his most famous opponent, Apollo Creed. He has the appropriate (and unfortunate) name of Adonis, and when we first meet him he’s a young boy in a childcare facility. He’s also beating up one of the other boys, so right away we know he’s got anger issues. And we know that these issues will resurface later in the movie to provide an obstacle to getting where he wants to be, and if by chance he meets someone significant, in being with the person he wants to be with. He’s given an unexpected reprieve from a young life busting other kid’s noses by the arrival of Apollo Creed’s widow, Mary Anne (Rashad), who takes him home with her. As an adult, Adonis (Jordan) is conflicted: he has a well-paid office job but he also fights down in Tijuana where he’s undefeated after fifteen bouts. He’s self-taught, self-motivated, but knows he needs a proper coach to help him make a name for himself in the ring. And that name needs to be Johnson, his mother’s name, because he doesn’t want to make it on the back of his father’s legendary status. So he resigns from his job, and moves from Los Angeles to Philadelphia, home of another boxing legend. There he approaches Rocky, who after the usual demurring, agrees to help him train to be a better, professional fighter. And he meets someone significant, in the form of wannabe musician and downstairs neighbour, Bianca (Thompson). Adonis is focused, and when he wins his first US fight against local boxer Leo ‘The Lion’ Sporino (Rosado), the cat is soon out of the bag in terms of his heritage. And with World Light-Heavyweight Champion ‘Pretty’ Ricky Conlan (Bellew) needing a fight in the next six months, the stage is set for the kind of fairytale ending that only happens in Hollywood boxing movies, and which includes highlights of a highly physical, hugely punishing twelve round bout (basically the kind that rarely happen in the real world). If some of the summary above sounds a little cynical, then it is. Creed is a movie that follows a well established template, and is incredibly easy to predict, right down to the outcome of Adonis’s bout with Conlan. There’s nothing here that you won’t have seen before, and there’s little that’s new or innovative. But fortunately, this is a movie where all that doesn’t matter, because what it does have is a fondness for and a charity towards the characters that allows them to feel like old friends even though you’ve only just met them. Adonis is the eternal child trying to find a place for himself in the world, and with only a single means to do it. He’s matched by Bianca, whose progressive hearing loss means she has to concentrate on her music almost to the exclusion of everything else. They’re both sympathetic characters and easily likeable, and both Jordan and Thompson have no trouble investing them with the kind of emotional honesty needed to avoid their becoming stereotypes. And then there’s the man himself, Rocky Balboa, aged, resigned to running his restaurant, and staying adrift from the world that made him famous. This is a character that Stallone has played for nearly forty years all told, and this is finally the movie where he gives his best performance as the Italian Stallion. It’s a modest, surprisingly complex performance, with delicate shadings that haven’t been seen in a Rocky movie before, and Stallone appears so at home in the role that it really does seem difficult to separate the two: is Stallone Rocky, or is Rocky Stallone? Either way, the much maligned actor is excellent in his signature role, and he reminds us of just how much heart and soul the character had back in the beginning. 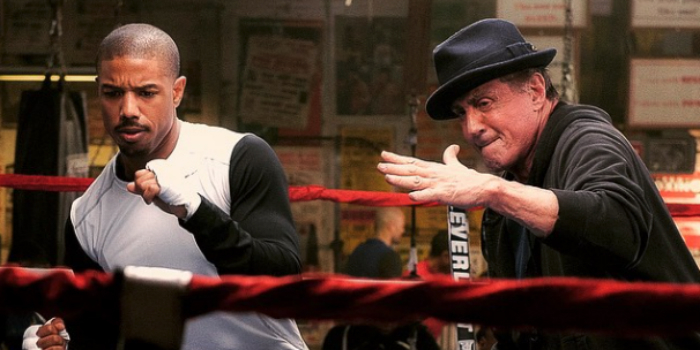 Away from Stallone, much of the movie’s success is down to the direction of Ryan Coogler. Coogler adopts a slightly unconventional visual approach to the movie which pays off during its quieter moments as the widescreen image is used to highlight a range of emotions. He’s also adept at keeping the camera in the ring, having it circle the boxers (and sometimes getting in between them) and prowl around every punch and blow. It’s a fluid performance by the camera, and superbly orchestrated by Coogler and DoP Maryse Alberti. The editing by Claudia Castello and Michael P. Shawver is also a plus in these sequences, interspersing the fluid camerawork with quick cuts and flourishes when the action needs to get in tight. There are references to the earlier movies throughout, though bizarrely, Rocky’s early morning training run is transformed completely, with Adonis trailed and then overtaken by local youngsters on a variety of souped-up bikes. Bill Conti’s iconic score is in there as well, though you might not always recognise it, and of course, those steps outside the Philadelpha Museum of Art get a visit, but in a way that’s less majestical and more realistic. 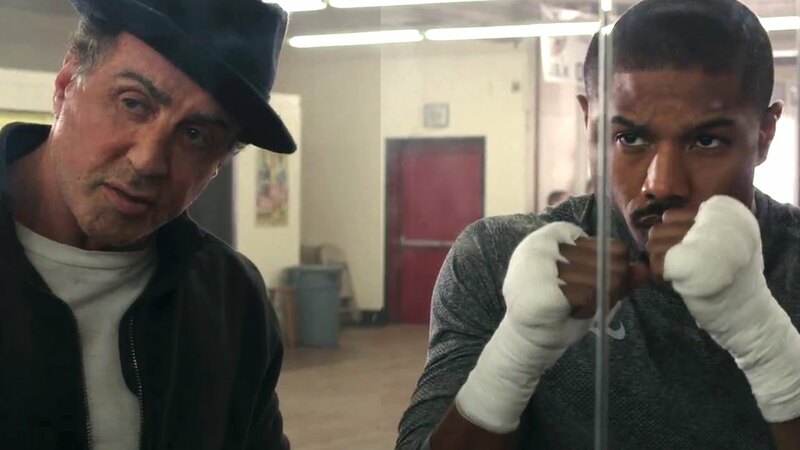 Fans will be pleased to see so much effort being put into what is the seventh movie in the series, and with the torch being passed from Stallone to Jordan, there’s always the possibility that we’ll be following Adonis Creed’s career for some time to come. 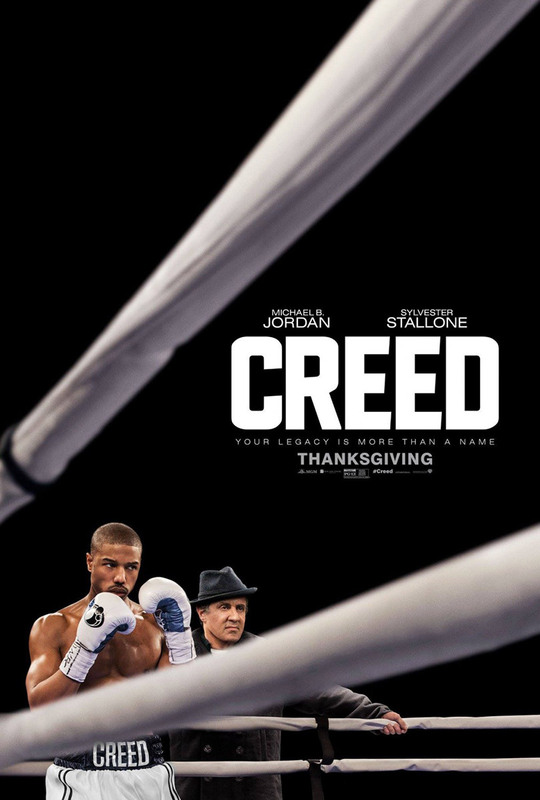 Rating: 8/10 – on a par with the first two movies, Creed is hugely enjoyable, and benefits from a script – by Coogler and Aaron Covington – that puts the characters first before the fight scenes; if there still remains a lack of development in some areas (the various subplots), there’s more than enough here to keep old, new and non-fans alike happy and satisfied. Billy ‘The Great’ Hope (Gyllenhaal) is both the light heavyweight boxing champion of the world and undefeated in forty-three professional fights. Defending his title against the latest challenger, Billy’s lack of defence causes the fight to last longer and take more of a toll. His wife, Maureen (McAdams) feels he should take some time off to fully recover, while his manager, Jordan Mains (Jackson), wants him to sign a lucrative contract with a TV network for three further fights. And another boxer, young and cocky Miguel ‘Magic’ Escobar (Gomez), is trying to goad Billy into letting him challenge for the title. At a charity event, a brawl between Billy and Miguel ends in tragedy when one of Miguel’s entourage accidentally shoots and kills Maureen. Devastated, Billy retreats from his daughter, Leila (Laurence), and embarks on a self-destructive path that sees him accept the TV network offer but lose the first fight in embarrassing fashion when he punches the referee, lose his licence to box professionally, be let go by Mains, lose his home and property through mounting debts, and when he tries to kill himself, he loses custody of Leila as well. Charged by the court to straighten himself out, Billy turns to boxing coach Tate Wills (Whitaker) to help him get back in the ring and in turn, regain custody of Leila. When it’s clear he’s back in shape and boxing better than ever, Mains reappears and offers him a fight he can’t refuse: against Miguel, now the light heavyweight champion of the world. 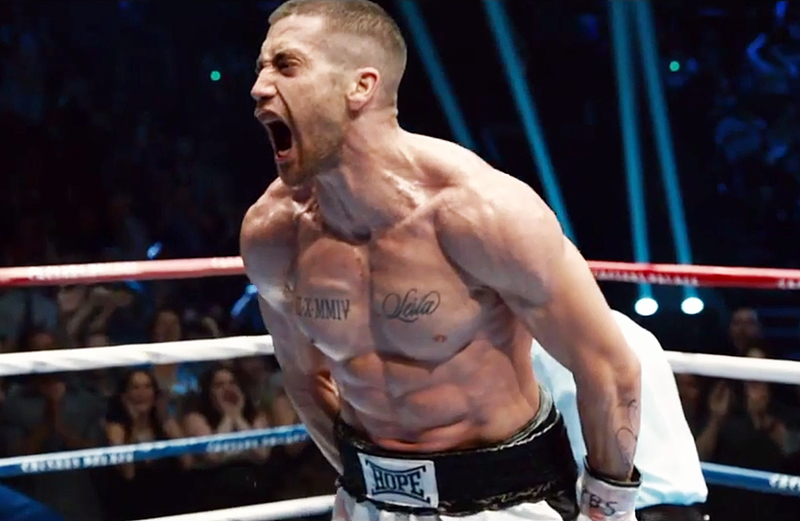 On paper at least, Southpaw should have been a sure-fire winner (or in boxing parlance, a knockout). With a director known for his visual flair and aptitude for strong male characters, a lead actor who – Accidental Love (2015) aside – is on one of the hottest streaks of recent years, and the screenwriter who created Sons of Anarchy, this tale of riches to rags to redemption should have been a gripping examination of one man’s descent into despair, and his journey back to a more stable life. But alas, Southpaw is a movie that consistently disappoints the viewer and sticks to such a precisely engineered, formulaic script that when there is a moment of unexpected originality, it sticks out like a sore thumb. And all this despite another physically demanding performance from Gyllenhaal, but one that is strangely lacking in the kind of passion that would have made Billy a lot more sympathetic. As it is, he’s a sullen presence throughout, and not very likeable either. McAdams and Whitaker fare better, taking the flimsiness of their characters and making them appear to have more depth than they actually have. But in the acting stakes it’s Laurence who steals the show (and somebody needed to), giving yet another outstanding child performance. Behind the lens, Fuqua doesn’t seem to have the energy to vary the tempo, leaving some scenes feeling flatter than others, while the estimable Mauro Fiore’s photography is reduced to showcase scenes that are so underlit that it makes you wonder if the production couldn’t afford lighting rigs or spots. Rating: 6/10 – too predictable and too bland despite the punishing boxing matches and the various attempts at emotionally manipulating its audience, Southpaw falls short of being a great boxing movie; it ticks all the boxes marked cliché, and never once tries to lift itself up off the canvas and land a killer blow. 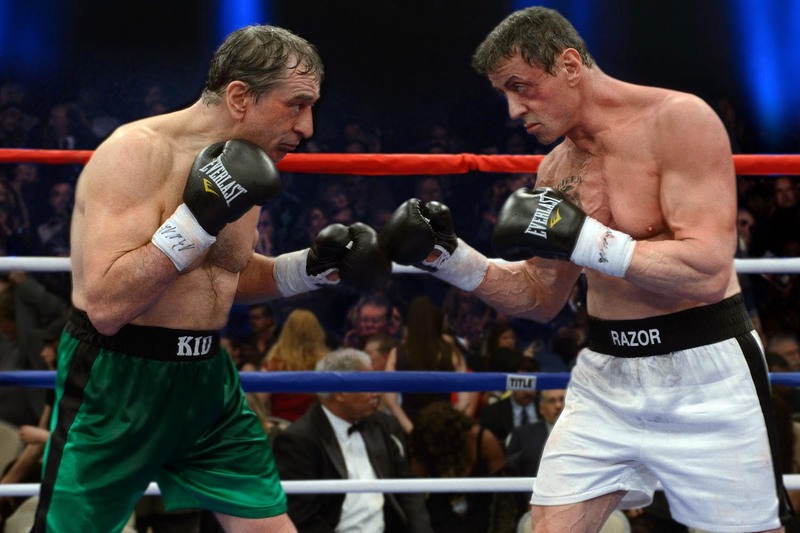 Thirty years after they fought against each other, ageing boxers Henry “Razor” Sharp (Stallone) and Billy “The Kid” McDonnen (De Niro) are tempted back into the ring for one last bout to decide, once and for all, which of them is the better fighter. When they first fought, Billy won easily. In the rematch, it was Henry who won. A third, deciding fight was planned but Henry refused to fight and retired from the ring. Billy has always wanted a third fight to happen, and when the son of their old promoter, Dante Slate Jr (Hart) offers both men a chance to get back in the ring and settle the issue, it all hinges on getting Henry to say yes. Initially reluctant, but eventually persuaded by the size of the payout – which he needs to pay the nursing home bill of his former trainer Louis (Arkin) – Henry also has to contend with the reappearance of Sally (Basinger), an old flame of his who slept with Billy and as a result, had his child (and awkwardly called him BJ). With Sally attempting to win Henry back, and BJ (Bernthal) becoming a part of Billy’s life, both fighters have to deal with long buried personal as well as professional issues before they can step back into the ring. As a piece of high concept matchmaking, the idea of bringing together Stallone and De Niro under the veiled banner of “Rocky vs Raging Bull” was probably too hard to resist (though why it’s taken so long for someone to come up with the idea is a little surprising). You can almost imagine the delight on the faces of the studio executives at Warner Bros when the pitch was made to them. You can also imagine that the script was the last thing they would have worried about. And while the whole idea has a whiff of Cocoon-style wish fulfilment about it, the basic plot is augmented with enough emotional and comedic incident to make Grudge Match watchable if not exactly unpredictable. The storyline involving Billy’s burgeoning relationship with BJ (it obviously stands for Butterscotch Jellies), is almost straight out of Screenwriting 101, but there’s enough there to make it affecting in a gentle, enjoyable fashion. Likewise the reawakening of Henry and Sally’s feelings for each other; again, nothing original and with the usual stumbling blocks along the way to true happiness, but done with enough feeling and conviction to keep the audience invested in the outcome. 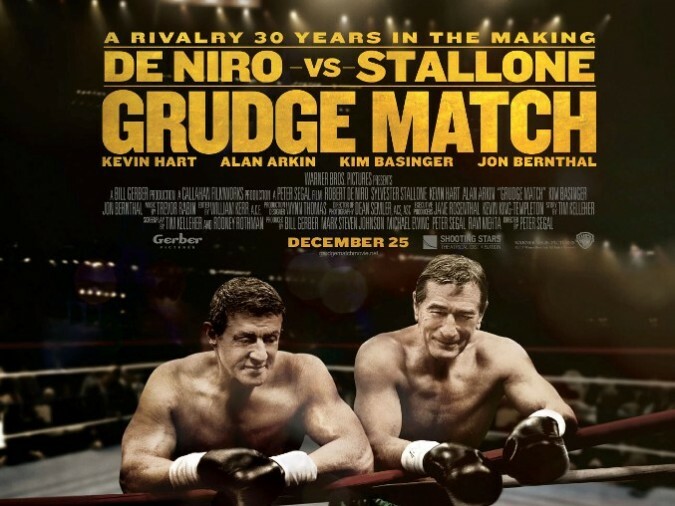 With its ageing cast required to poke gentle fun at greater glories – Stallone wanting to punch a slab of beef during a training session and being soundly told off for it, De Niro getting heckled at a speaking engagement – Grudge Match never really aims to be as dramatic as the set up might imply. Its notions of family ties and relationships aside, the boxing side of things is played mostly for laughs, particularly when both men agree to provide motion capture for a video game, or when pressed to make a public appearance together. It’s only when the fight finally happens that the comedy is dropped altogether and the two men – both in remarkably good shape – batter each other over twelve rounds. The rivalry, such a big part of the script and the plot, is allowed a proper resolution here, and it’s good to see a way in which both men can be seen to be winners. This awkward mix of comedy and drama, both lightweight yet curiously satisfying, is saved by the sterling work of its cast. Both Stallone and De Niro are fun to watch, and while neither is stretched (in or out of the ring), they acquit themselves well. As the lost love who wants a second chance, Basinger fares well with an under-developed role, but it’s always good to see her, whatever she’s in. Left with the bulk of the dramatic content, Bernthal is still a fresh enough screen presence that you’re never entirely sure what he’s going to do next, and this helps immensely in his scenes with De Niro. The comedy then is left to Hart and Arkin, Hart edging it with a manic, ADHD-style performance that appears largely improvised and is often very funny, while Arkin replays his crotchety OAP from Little Miss Sunshine (2006) and almost steals the movie. On the production side, the movie is well-mounted without being spectacular or too visually arresting, and the location work is suitably low-key and reflective of the two fighters’ backgrounds and current circumstances. The movie flows thanks to Segal’s capable direction and William Kerr’s measured editing, and while the photography by Dean Semler is mostly subdued by the wintry colour scheme, it’s still sharp and carefully framed throughout, with good compositions and blocking. Trevor Rabin’s score supports the action almost casually, and there’s fun to be had looking for background references to both Rocky and Raging Bull. In the end, Grudge Match fails to live up to its potential by choosing to tread some very worn paths, and by failing to decide whether it should be a comedy with dramatic elements, or a drama with comedic moments. The script by Tim Kelleher and Rodney Rothman could have been tightened a little, but it remains what it is: effective in a predictable, sometimes banal way, but falling short of making a solid impression. A shame, then, as the basic premise is a good one. Rating: 7/10 – not as bad as it could have been but equally not as good as it should have been, Grudge Match won’t win any awards (probably) but it’s a pleasant enough way to spend a couple of hours; a movie that, sadly, in boxing terms is “punching above its weight”.